Tried searching here and in the issues, with no luck finding information on any plans to release Pythonista with 3.6. @omz, any plans to share? Thanks! I'm making progress... There's still a lot left to do, but it's looking good so far. Is that the new virtual keyboard you were talking about? I am not sure how custom that virtual keyboard is, but I would like to vote for a more accessible hashtag character. The gear icon means that we can access the tools-menue (currently accessible by the little wrench icon) from they keyboard? Or is that only there because this is some kind of default qwerty layout? If not I also would like to vote for that. It would also be cool to be able to register shortcuts for stuff you frequently use. @zipit Yes, that's the custom keyboard I've been working on. It's not quite done yet, but I've been using it for a while, and I like it so far. The gear icon shows an options menu for the keyboard itself, e.g. it allows to switch to the system keyboard, and things like that. I also intend to integrate snippets, but that's not done yet. Integrating the tools menu is also an interesting idea, I'll consider that. As for the # character, where would you put that? I can't really make the keys on the extra row much smaller, and I don't really see a key there that I'd remove to replace it with #. Btw, you probably know this, but you can do a quick swipe-up gesture on the _ key to insert #. Custom goodness! Please include an option to have an "end edit" button or maybe swipe down gesture on iPhones. @mikael This is currently iPad-only, and will probably remain that way. You can already swipe down to dismiss the keyboard on iPhone btw (swipe down on the editor, not the keyboard itself). Actually I had not really thought about it. I had something like a modifier key in mind. I like the fact that the new keyboard lost a row but the hashtag character is IMHO quite essential for python. The word character keys do look quite empty regarding modifer keys, but I do not know if you can modify them. I personally never did care much about snippets (I think I was a bit unclear there, I actually meant shortcuts to little python scripts interacting with the editor: autopep8, autodocstring, linting etc. - I am lazzy, I use them alot), but since you mentioned them: An alternative route for shortcuts could be to allow to execute a python script instead of a snippet. Basically a command palette that would appear in the auto-complete bar. It is always a little bit of a hassle to use editor scripts atm. Yes, but only if your keyboard dismiss mode is set right (not on by default) and TextView's content is big enough so that it is scrolling. And never in TextFields. To me it would at least make sense to provide a standard option for having a dismiss key on the keyboard, instead of everyone having to implement varying custom solutions. And oh, no, I did not mean that a dismiss option is needed while editing code on iPhone, only during the execution of a UI script. I agree that the swipe down is quite sufficient while editing. @lachlantula I don't expect any packages to break with the switch to Python 3.6. I've also added enhanced syntax-highlighted for f-strings – embedded expressions get a different background color, and (perhaps more importantly), code completion is available within those expressions, so it's faster to enter variable names etc. within a string. I've noticed that the new beta requires iOS 10. Any idea if that will also apply to the release version? My iPad is stuck on iOS 9, and while it is getting a bit old, it still runs well enough that I don't want to buy a new one yet. I can understand that you don't want to support iOS 8 for much longer (though JonB probably wouldn't like that...) but iOS 9 isn't even two years old. @dgelessus I'll probably support iOS 9 in the release version, I just didn't have time to test it at all yet, and I suspect that some keyboard-related things are broken right now. Continued iOS 8 support is a lot less likely (sorry, @JonB!). 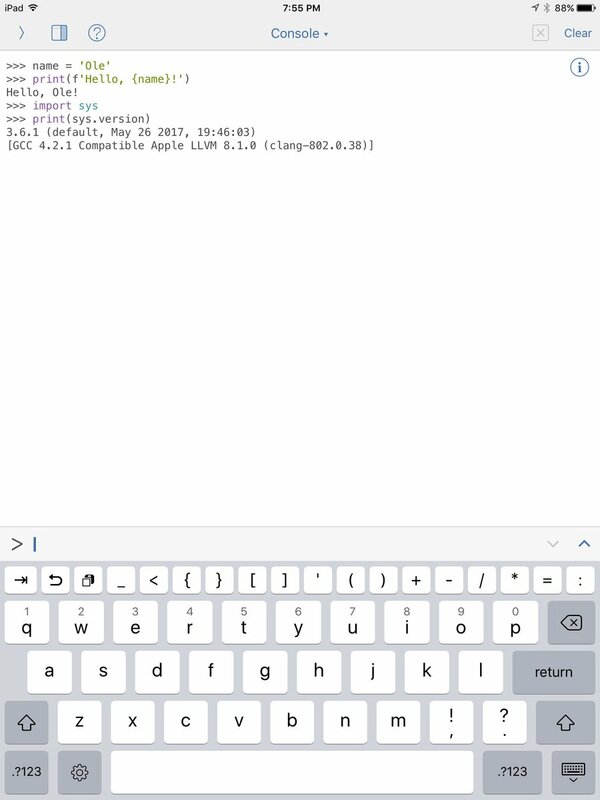 The new coding keyboard depends on a particular iOS 9 API that I don't know how to replace, and while I could just disable the coding keyboard in iOS 8, at some point it's just too much of a hassle to drag it along for just about 5% of the total user base (probably even less for Pythonista in particular).